The church building, 306 East Second Street, now United Methodist Church was first a United Brethren Church. In 1946 it merged with Evangelical and was known as Evangelical United Brethren. Then it merged with Methodist in 1968, becoming the United Methodist Church. Following the union, services were continued in each church known as Calvary United Methodist and Trinity United Methodist. Sunday, Nov. 24, 1968, the two churches merged, forming one congregation, and name changed to United Methodist Church. The first part of this service was held in Trinity Church on West Second and a processional led them to Calvary United Methodist on East Second. They sang "Lead on O King Eternal", an impressive service with tears and mixed emotions. An auction sale by both churches was held disposing of unneeded materials. The Methodist church building was sold, and the front part was torn down and back part is now used by M & W Inc. The Methodist Church was built in 1845 (nine years before United Brethren). Rev. Griffith, Liberty Mills Circuit said, "If you don't build me a church and a parsonage, I'll go to North Manchester." They didn't, so he came to North Manchester and the First Methodist Church was built. There was no bell and a big triangle of steel was hung by the door and the janitor would pound it, making a noise that could be heard all over the town, thus calling the congregation to worship. This church served the Methodist congregation until 1873, when a new building was built at a cost of $47,000. Later (in 1912) Fellowship Hall was built to the north. In 1923 another addition was made to the East, Sunday School rooms, a kitchen, and a pastor's chapel. In 1951, more improvements were made, sanctuary turned around, and served the congregation until the merger, Nov. 24, 1968. The First United Brethren service was held in a barn owned by Richard Helvey in 1844, three-quarters of a mile northeast of Manchester College, known as Harve Cook farm. Later Helvey became a part owner of a hotel known as "The American House", located where Maynard's Men's Shop now stands. It was in this barn that United Brethren services were held. The United Brethren had no church until 1854, and held revival services in Lutheran Church. The Lutherans had built their first church in 1847. Mahlon Frame, seeing the need of a church, donated the lot on East Second Street and a frame church was built west of the present United Methodist Church, and dedicated in 1854. It served 31 years. The deed cost $20 and total cost and furnishings of the church cost $468.82. Church was heated by two stoves and lighted with candles. The bell was purchased for $100. Martha Farmer, age 97, a member 82 years, now living at Timbercrest, is the oldest living member of United Methodist Church. Her father was the first Sunday School Superintendent of the United Brethren Church. In 1885, a new brick church was built, and old one moved back. This church had a one-register furnace, which didn't heat well until four years later when four cold air registers were installed. It was lighted with 30 oil lamps. The 10 art glass windows are still in the present church. The old frame church, sold to Progressive (First Brethren) Church in 1885 for $200, and moved to corner of Fifth and Sycamore, was used until 1912. Then George Myers bought it, tore it down, and lumber was used to build houses on West Fourth Street, known as B.F. Ober and A. I Mummert houses. A barn on the church lot, sold to David Krisher, is the present site of the book bindery. He bought the parsonage for $20 and moved it to South Sycamore, and filled it with onions for winter storage. It was heated by a stove, caught fire and burned to the ground and filled the town with "onion smell." In 1914, the church was remodeled, a heating system, basement, kitchen and toilets. The original bell cracked, and a new one was purchased. In early days the bell was tolled at the death of a member, and always cast a shadow of gloom. The life of a minister was interesting. Rev. Fletcher Thomas told an interesting experience of his 57 years as minister. A revival was being held, and an irate father came to revival service to take his daughter from the altar. He rushed up with his coat off, and struck at the minister. The next minute he was thrown out of the church. The little girl's brother added the finishing touch when he said, "I told you, dad, them preachers would throw you out." In those days hymn books were scarce so the preacher would read 2 lines of the hymn then the congregation would sing. This was called "Living a hymn". The present church building was remodeled in 1954, and additions made at a cost of $9200. The auditorium, which faced north was reversed to face south, an electric organ was installed. Church is now on the verge of another building program. Some three or four years ago the ladies of this church foreseeing the necessity of raising means to build a new church edifice organized a system of social entertainments, at which the guests were expected to contribute a small sum of money to a fund which they were determined to raise to furnish the new church and aid in its construction. The ladies also organized other helps to add to this fund, such as excursions, festivals and picnics, and by persevering efforts in this direction, they succeeded in raising about $1,000. About a year ago the male members of the church decided that the old building would not do much longer and they took steps to build a new one immediately. Estimates and a plan of the building were made and subscriptions enough obtained to warrant the building committee in commencing the work in the spring and summer of '73. Michael Hively was appointed general superintendent and the work commenced in June and was pushed forward as fast as could be to completion. 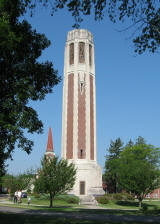 The building on the old church lot is of well burnt brick on a stone foundation 38x70, Gothic style, with a brick tower or belfry at the southwest (front) corner 44 feet high capped with a spire 71 more making 115 feet from the ground to the highest point. Outside the building presents a very substantial as well as handsome appearance. Inside it looks equally as well. The audience room is 26 feet from floor to ceiling. The building is entered by two doors in the south end, one near each side. Between the doors is a class room on the first floor separated from the audience room by folding doors. Above the class room, and the entrance halls is the gallery well seated and in full view of the pulpit. The building is lighted through handsome stained or colored glass windows that obstruct the direct rays of the sun and therefore require no blinds. The aisles and the platform are neatly carpeted. The seats are made of ash lumber handsomely trimmed with black walnut, the pulpit is also of ash and black walnut, it was manufactured and presented to the church by S.A. Argerbright, a handsome marble top communion table, a present by J.H. Straw, and three elegant upholstered chairs complete the picture. Last Sunday the church was dedicated, by the Rev. Dr. Pearne, of Cincinnati, assisted by Rev. N. H. Phillips, P.E. Rev's. Johnson, McElwee, E.P. and Chester Church. The church cost about $6,000, $2,200 of which sum remained unpaid when the congregation met last Sunday morning, but by devoting about one hour and forty minutes judiciously to that financial problem, the question was satisfactorily solved by the audience, almost every one of whom contributed something to the fund $2,540, which was there subscribed, enough to clear the church of all debts and fence the lot in a very handsome manner. The contribution was unprecedented when we consider the number present and the wealth represented and the members and Pastor of the M.E. Church in North Manchester tender their heart felt thanks to their numerous friends who came so nobly to their aid. The dedication will long be remembered by all present. At the conference of 1840, the Rochester Mission was formed, commencing at a point west of Rochester, in Fulton County, Ind., and extending east of Columbia City, embracing a territory of about sixty miles in length, and from ten to twenty miles wide, with Rev. E. Doud as preacher. The conference of 1841 sent Rev. Ancil Beach on this mission, and toward the close of that conference year, Liberty Mills and North Manchester were taken in as regular preaching appointments, and a small class formed at each place. The conference of 1842 returned Rev. Ancil Beach, with Rev. N. Green as assistant. In that year this circuit extended only a short distance above Liberty Mills—the Columbia City Circuit having been formed from the east end of this mission. During that year, this mission enjoyed considerable prosperity, and a great many were added to the church. At the conference of 1843, the mission was farther cut down, and Liberty Mills Circuit was formed, with Rev. C. Wesley Miller, preacher in charge. In 1844, Rev. Warren A. Griffith was sent to this (then Liberty Mills) circuit. There being no parsonage on this circuit at that time, the minister removed with his family to North Manchester in the spring of 1845, where he began the work of building a parsonage and meeting-house. During that year he succeeded in having a parsonage and five new churches erected within the limits of this circuit. At the conference of 1845, the name was changed from Liberty Mills to North Manchester Circuit. George Guild was sent as preacher in charge. In 1846, the conference sent Rev. D.F. Stright—the interests of the church meanwhile advancing steadily. Mr. Stright was returned to this circuit by the conference of 1847, and during a portion of this year Rev. John Hill was employed as assistant. In 1848, Rev. Eventus Doud was sent as pastor in charge of this circuit, and was returned by the conference of 1849. Rev. W.S. Birch was assistant during a portion of this year. In 1851, Rev. N.E. Manvill was the pastor in charge; in 1852, Rev. Milnor; in 1853, Rev. William Palmer; in 1854, Rev. John Davis; in 1855, Rev. J.H. Payton; in 1856 and 1857, Rev. J.B. Bradshaw; in 1858 and 1859, Rev. F.A. Sale; in 1860 and 1861, Rev. E.P. Church; in 1862, Rev. Thomas Colclazer; in 1863, Rev. J.H. Hutchison; in 1864, Rev. Hosea Woolpert; in 1865, Rev. W.T. Smith; in 1866 and 1867, Rev. A.C. Barnhart; in 1868-69 and ’70, Rev. M. Wayman; in 1871, Rev. Samuel J. McElwee; in 1872, Rev. J.S. Sellers; in 1873, Rev. Enos P. Church, who was returned to this charge by the conference of April, 1874, serving the church until March, 1876. Rev. W.R. Jordan was appointed pastor March 27, 1876, and continued in charge until April, 1877, when Rev. B.A. Kemp was appointed his successor. Mr. Kemp was succeeded, in 1881, by Rev. John B. Carns, the present pastor . Early in the following spring, work was resumed, and by the 1st of August, 1874, the church was completed. On Sunday, 1st of August, 1874, the church was completed. On Sunday, August 16, 1874, it was dedicated by Rev. Thomas H. Pearne, D.D., of Cincinnati. At that time there remained against the church a debt of $2,000, but, upon the day of dedication, subscriptions were received to the amount of $2,584.04. The church is a beautiful brick structure, 38x70 feet, and was completed at a cost of $7,000. Since the establishment of North Manchester Circuit great changes have taken place. In the earlier years, it embraced nine regular appointments, but has since been cut down to include only two, viz., North Manchester and Liberty Mills. This church has proved a power for good in the community, and in the matter of church extension its members have manifested commendable zeal. In 1881, Mrs. Sarah C. Carson, of Liberty Mills, contributed $250 to this fund, which called into existence a frontier church at Green City, Mo. ; and Dr. Ph.D. Paul, a traveling physician, contributed $250 to church extension, with which was erected a church at Wessington, Dak. At Liberty Mills, the Methodist society worshiped in the schoolhouse until 1850. In that year, however, they erected their present house of worship, being joined in this undertaking by members of the Odd Fellows and Masonic fraternities, who added the upper story to the building for a lodge room. This is a brick building, 40x50 feet. It is attached to North Manchester Circuit, and is now under the pastoral care of Rev. J.B. Carns . In the 1844, a small band of adherents of this denomination—some ten or twelve in number—met in the barn of Col. Richard Helvy, and under the leadership of Rev. Surran organized the United Brethren Church. They maintained their organization, but without any permanent place of meeting, the houses of their several members serving this purpose. About the year 1852, a series of revival meetings, held in the Lutheran Church by Rev. John Thomas, resulted in a large accession of membership, and the church seemed imbued with new life. In 1854 or 1855, a lot was donated to the society by Mahlon Frame, on Second street, between Mill and Sycamore, and the building of the present house of worship was at once begun. It is a plain, substantial frame building, 36x48 feet, and was erected at slight cost—much of the labor and material having been contributed by members. The church was dedicated by Bishop Glossbrenner, assisted by Rev. H.M. Hickee, who was the pastor in charge at the time. In the intervening years, the church has grown and prospered, and now  has a membership of between 130 and 140 persons. The pastors who have served the church since Rev. Hikee are Revs. J. France, B.S. Clevenger, P. Wells, F. Thomas, G. Crouse, S.K. Wells, E. Johnson, B. Fannin, S. Barcus, E. Seithman, J.R. Brown, J. Hippensteel, William Simons, J. Morrison, Forbes, Prouty, Fast, and Rev. Prentice, the present pastor .